Take the guess work and flat spots out of sewing perfect circles. 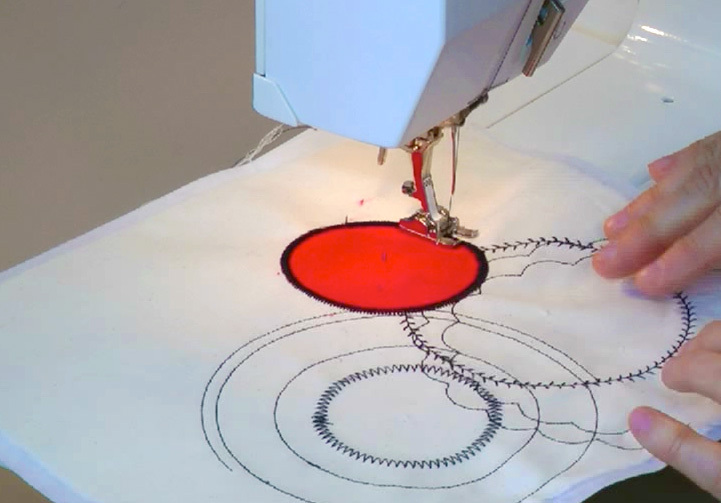 Learn to use a Circular Embroidery Attachment to stitch circles with decorative stitches and yummy threads. 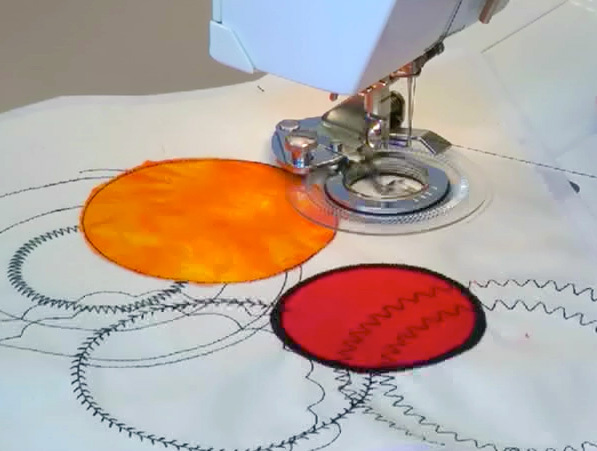 What about stitching perfectly appliquéd circles? Easy when you know how! Why not plant a pretty garden with a Flower Stitcher? Utility stitches like a blind hem stitch create unbelievable flowers. Let's quit yakking and start stitching! Just click the Play button in the video below. Most machine manufacturers have a Circular Embroidery Attachment. It's worth checking it out. It's SEW much fun! Stitching perfect circles isn't hard when you know how. Easiest circle appliqué ever! Learn how in class. Can't find an attachment? I'll show you a low tech alternative. You might need an adapter, but the Flower Stitcher will fit any machine. Wait til you see what it does! Get your Flower Stitcher here. Both utility and decorative stitches are perfect for sewing beautiful circles and flower forms. Learn to use both. 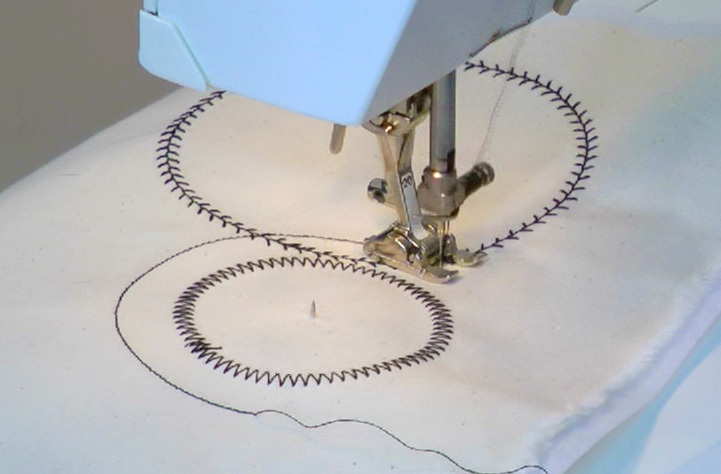 Today, most sewing machines include a variety of decorative and utility stitches. In the market for a new machine? Get one here. 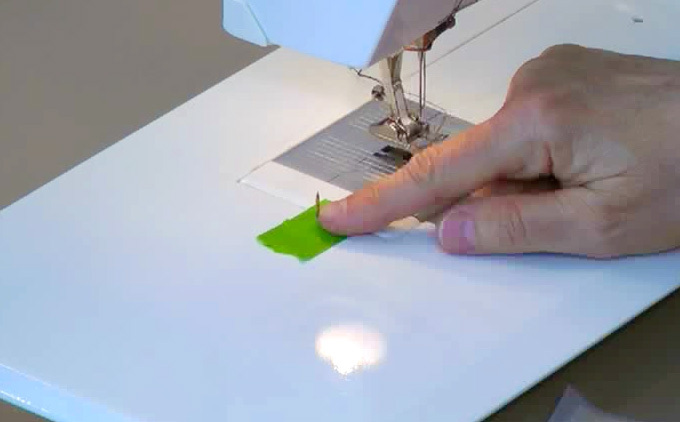 Most sewing machine manufacturers have a Circular Embroidery Attachment available. Check with a machine dealer. Any decorative stitches sew better with an Open-toe Presser Foot. Get one that looks like this. My favorite fabric to practice with is plain calico or muslin. Get muslin here. Stitching circles is MUCH easier if you stabilize the fabric. My favorite stabilizer is Ricky Tims Stable Stuff. Get it here. Another good stabilizer is Tear Away. Get it here. Attach fabric to stabilizer with Sulky KK2000 Temporary Spray Adhesive. Get it here. Pretty stitches need pretty threads. Get Rayon Embroidery 40wt. thread here. Get Polyester Embroidery thread here. Buy Sulky 12wt thread here. And, get my all time fav King Tut Variegated thread here. I prefer Topstitch 90/14 needles for decorative stitching. Get them here. Appliqué Scissors (also called duck-bill scissors) help prevent trimming accidents. Get beautiful scissors here. 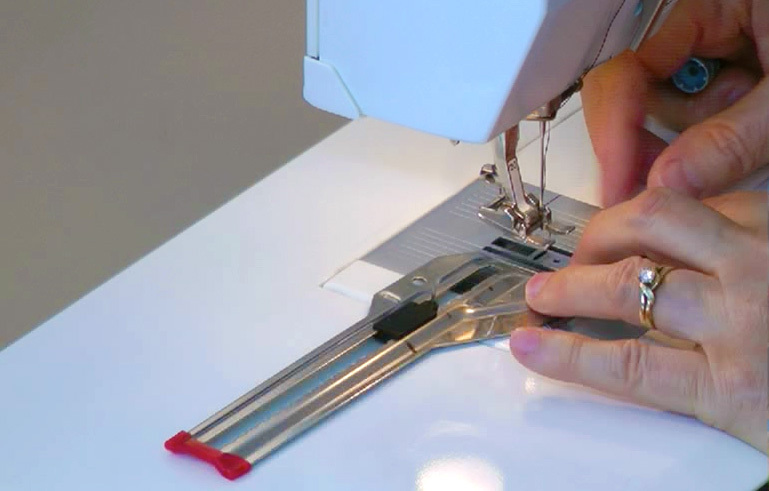 Always use small scissors around your sewing machine. Get my favorite small embroidery scissor here. It's surprising how often you need a screw driver in your sewing room! Get one here. I find pliers very helpful for tightening the Flower Stitcher adjustment knob. Buy a good pliers here. 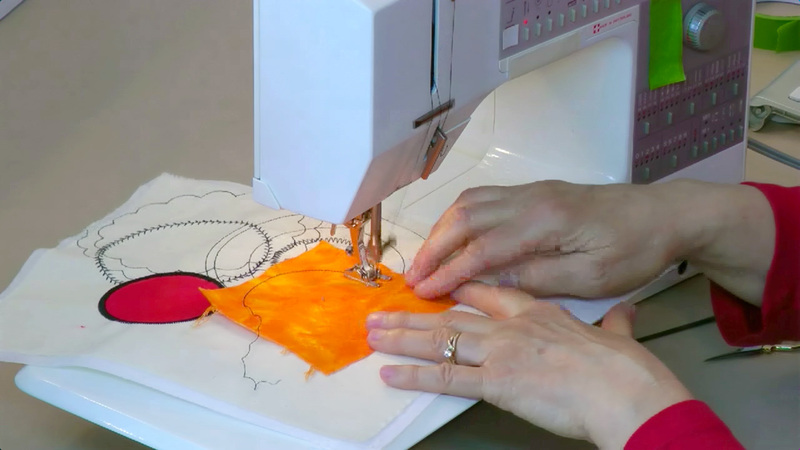 If you can't find a Circular Embroidery Attachment for your sewing machine, use a regular thumb tack or an upholstery tack with a flattened head. Get thumb tacks here. Get upholstery tacks here. I use a lot of Painter's Tape in my sewing room. Buy tape here. Did you ever notice how many Circles you see everyday? Look around. They’re everywhere! Just looking around in my studio I see Circles in bottles of paint, a coffee cup, containers that hold art supplies, my dog’s eyes, light fixtures, clock face, and my own face for that matter. Those are just the random Circles that jump out at me. Circles are found in all cultures because it’s one of the most common and universal shapes. Every shape symbolizes something, but none much more powerful than the simple Circle. Images of a circular sun make you think of warmth, growth and light. Circles have long been associated with safety, protection, and completeness. It’s really easy to draw a perfect Circle because you only need a compass or a plate to use as a guide. But Sewing Circles is an entirely different story! Seems silly, doesn’t it? Since it’s easy to draw a Circle, why can’t you just draw one and then stitch on it? I can be completely focused on stitching right on the line and no matter what, there’s always a divot or a flat spot. Can you say annoying?! Stitching wonky Circles, on the other hand, I’ve got down to a science. I’m not really known for perfection. My philosophy is usually, “Oh I didn’t expect that, but look how cool it turned out!” But, here’s the deal. When I decide that I want to Stitch a Circle without bobbles or looking like a flat tire, perfection seems reasonable. LOL! If you’re like me and like Circles, I bet you’d like to use them in your Sewing projects. Circle appliqués, concentric Circles, yarn or fiber Circles, Circles from decorative stitches or just plain old straight stitch Circles are all cool ways to add symbolism and color. All you need to know is how to do it and then the sky is the limit. Some Circles are best stitched with feed dogs down and others are easier without the feed dogs engaged. I’ll show you which is best for each type of Circle and what presser feet work well. When Sewing Circles, it’s the perfect time to use the beautiful threads you’ve been hoarding. Stitched Circles really showcase them and if you’re going to use those beauties, let’s draw attention to them, right? I have lots of examples, too, so you can see ways you might incorporate perfect Circles in your projects. Sewing partial Circles really adds a lot of interest and variety, too. 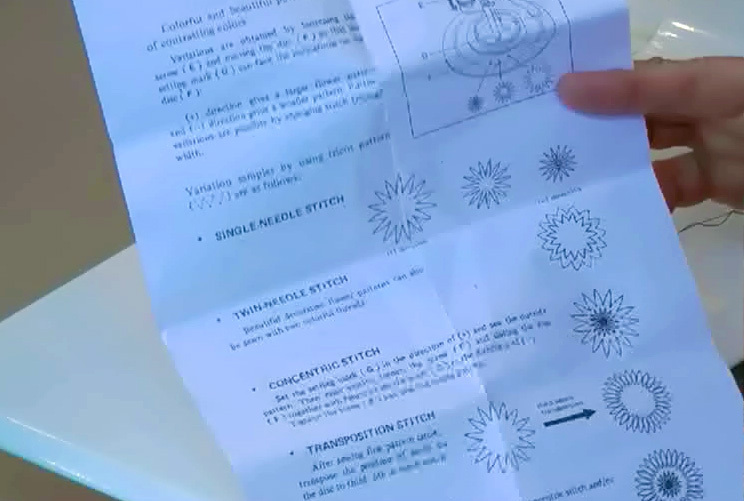 I’ll show you Sewing Circles from 1/2” to 10” in diameter with perfection. Ready to learn the secrets? It’s really simple. Just click the button in the video to join the class and I’ll meet you there.